Superman The Movie slot is another added to the ever-growing catalogue of DC Comics licensed theme slots by Playtech and their co-conspirators Ash Gaming. 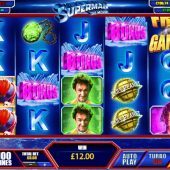 We've moved on now from the original Amaya Superman game and now have a 5 reel 4 row slot with 100 pay lines, although only 60 credits are needed per spin. The musical score from the first Superman film is constantly reminding us of Superman's powers and indeed on certain wins and feature entries you are treated to various film clips. Our superhero and his friends are single and stacked on all reels as are the card symbols but only to 2 rows high. The pays are quite low being a 100 pay line slot and Superman himself gallantly offers a mere 8.33x stake for 5-of-a-kind and the lowest card symbols a mere 0.33x stake for the same! There are Wilds either single or double stacked on all but the first reel and these are in the form of the Superman logo. There are no in-play random features like for example when Superman flies across the reels dropping Wilds in the Superman 2 slot. So where does the value lie? Should you land 3 pink bonus crystals on the middle 3 reels you are given a pick-me screen with a line of crystal rods to choose from. They pay 1 to 10x stake each and there are a couple of enhanced ones. If you pick the Superman logo when you break one this removes a green crystal from the remaining ones, which is important as that is your 'collect' reveal that will end the round. It doesn't give an extra life though so is really pointless, as how do know how many green crystals are hidden there in the first place? Picking a 3 or 5x symbol multiplies your accumulated winnings to that point, but not thereafter. You can also land 3 'free games' scatters on reels 1, 3 and 5. This is far more interesting than the stale old pick-me feature above. You get 10 free games and all Wilds are sticky and remain in place until the end of the 10 spins. Now Superman does get benevolent, as there is a guaranteed retrigger! Once the 10 spins are over, you get another 10 spins with all the sticky Wilds that you accumulated (hopefully) in the first 10 spins remaining in place. The Wilds are removed from the reels though in the second round so you cannot gain any more sticky Wilds.